In January 2012 Catherine announced her patronage of East Anglia’s Children’s Hospices</a> </strong>and right away this organization began to tug at the heart strings of royal watchers everywhere. It was March of 2012 when Catherine made her first public visit to “The Treehouse” EACH’s bespoke facility in Ipswich, Suffolk. Everyone there was so excited and royal watchers everywhere were both excited and more than a bit nervous. Catherine was scheduled to give her first ever public speech as a member of the royal family. My heart truly went out to her, I know how terrifying public speaking can be and to have to give a speech with not just a small audience of invited guests but the world’s media watching?…I’d have been hiding in the nearest broom closet, under a bed…somewhere, anywhere…hide me. She handled it well though she made it clear she wished William had been able to be there (he was still away in the Falkland Islands). Her work with EACH made A Petite Princess get involved in a big way and we are never happier than when we are asked to assist. Currently, their big fundraising focus is The Nook Appeal. So what is A Petite Princess doing to help withThe Nook Appeal? 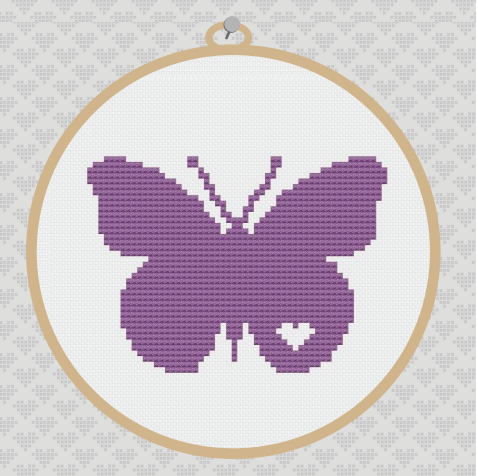 Well, through our sister site Stitched By Trisha we are offering a hand-stitched butterfly design that features a heart in the wing and 25% of the cost is being donated to EACH for the Nook Appeal.